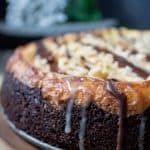 Rich and decadent Snickers Brownie Cheesecake, with a fudgy layer of brownie topped with peanuts, caramel cheesecake, and caramel and chocolate drizzle. This recipe is low carb, keto-friendly, gluten free, sugar free, and a Trim Healthy Mama S Fuel. 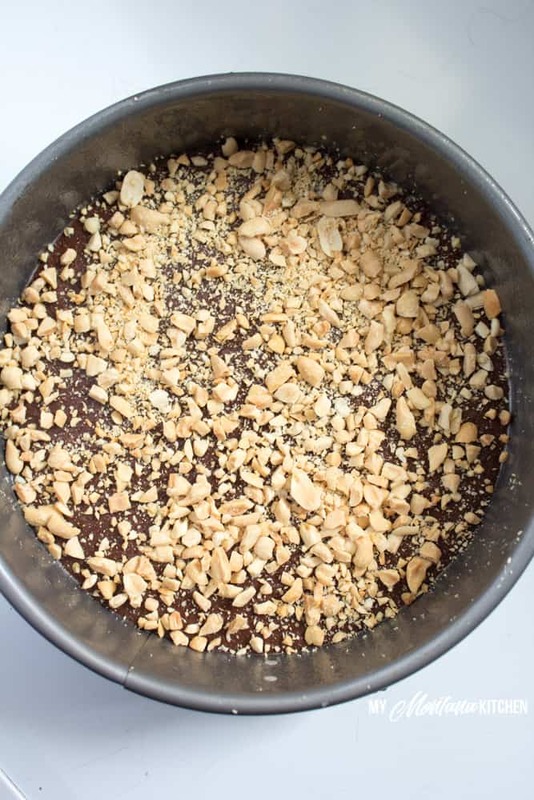 I love brownies – they are probably one of my favorite desserts – EVER! And who doesn’t like cheesecake? This recipe combines two of my favorite things for a stellar dessert! This is another reader-requested recipe makeover. A reader sent me a link to a Facebook video for Snickers Cheesecake Cake. After viewing the video, I thought it was little over-the-top (though it did look amazing)! Chocolate cake on the bottom, snickers cheesecake in the middle, and another chocolate cake on top. Covered with chocolate ganache and caramel sauce. It was decadent for sure! However, I wasn’t sure that my readers would want to have to put that much work into a dessert (even if it would taste amazing)! So I took the idea of a Snickers Brownie Cheesecake and combined some of the ideas from the video. Then on top of the brownie is a caramel cheesecake layer. Top it all off with peanuts, chocolate, and more caramel sauce and you still have a decadent dessert, but without all the intermediate steps! Before Trim Healthy Mama, the Snickers candy bar was my favorite. I loved the crunch from the peanuts and all the caramel, chocolatey goodness! Because I love those flavors so much, I have a couple of other Snickers-themed recipes on my blog! Both of the recipes above have received a lot of positive reviews, so make sure you try them out (AFTER you try this recipe, of course)! If you are not fond of the crunchy peanuts, feel free to leave them out completely. Or, if you would rather have a plain brownie cheesecake, simply omit the peanuts and caramel and chocolate sauces. This would also be delicious plain (as in just brownie and cheesecake) with fresh strawberries on top! Please do not be intimidated by the amount of steps for this recipe. It looks difficult at first, but it really is not hard. And sometimes good things take a bit of time, right? 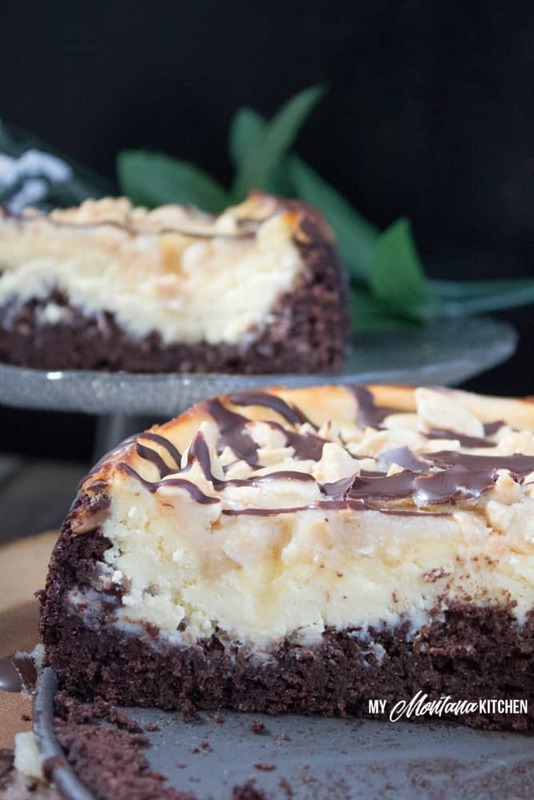 And if plain chocolate cheesecake is your thing, then check out this delicious recipe for No Bake Chocolate Cheesecake! 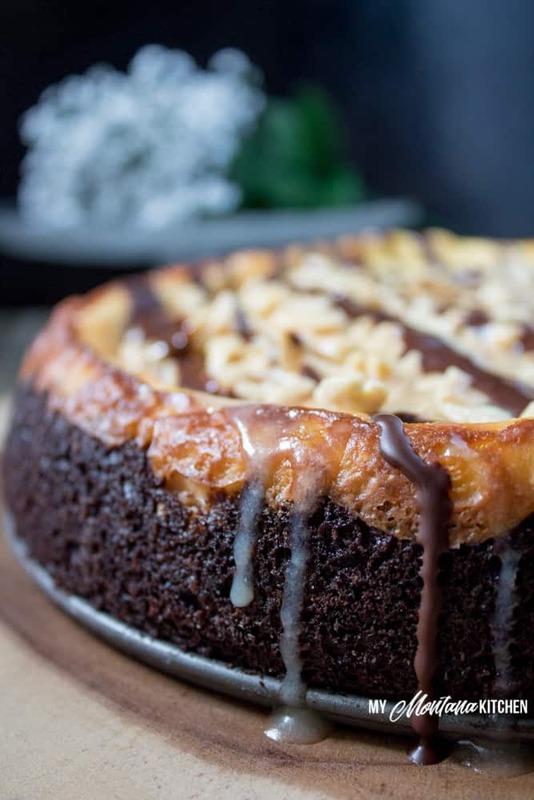 So, what do you need for this Snickers Brownie Cheesecake? 1/3 Cup Melted Coconut Oil I use refined coconut oil so there is no coconut flavor. In a saucepan, melt butter and Gentle Sweet over medium low heat. 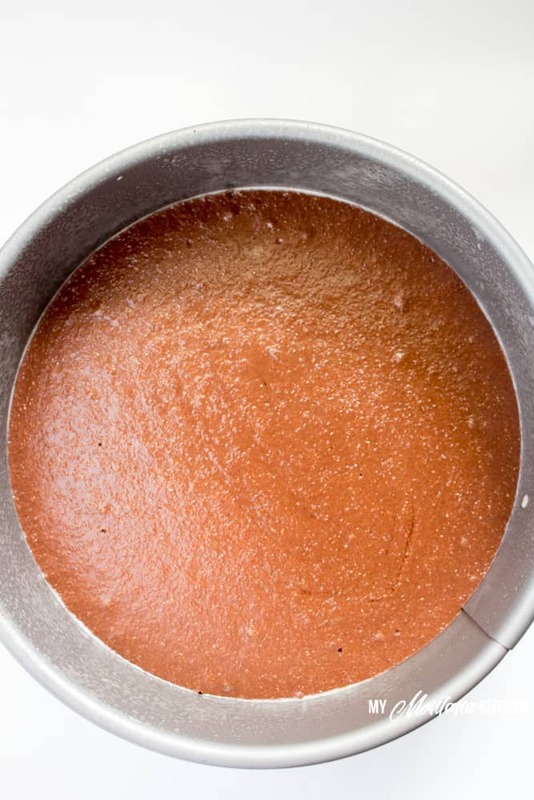 When sweetener has completely melted, continue to simmer for 1-2 minutes, stirring continuously to prevent scorching. Add salt and heavy whipping cream. Continue to simmer for 1-2 more minutes, still stirring continuously. Beat the softened cream cheese and Gentle Sweet until smooth. Add 1/4 Cup Caramel Sauce and mix well. Add remaining cheesecake ingredients and mix well. Sprinkle 1/2 Cup Crushed Peanuts over the brownie batter in the Springform pan. Spread cheesecake mixture over the peanut/brownie layer. Sprinkle remaining 1/2 cup crushed peanuts over the top of the cooled cheesecake. If you do not have the THM Gentle Sweet, you can use my Low Carb Powdered Sugar in equal amounts. Or you can use Pyure (available at most Walmarts), but only use half the amount. I made this yesterday for our church fellowship. It was entered into a contest, but I didn’t tell anyone it was sugar-free! ha! Everyone LOVED it! (A Kentucky Derby pie won the contest, by the way.) Unfortunately there is NONE left! I will definitely make this again! It was delicious! Did you use full-fat cream cheese? Do you think using the less fat version would affect how it sets up? Can I use all super sweet? That’s all I currently have on hand. Yes, I would think so. I would half the amounts. I just used a standard sized pan – I would say an 8-9 inch pan? Made this today and Oh.My.Goodness.! It is absolutely delicious! I already want my dessert and I haven’t even ate supper! Thanks for the recipe! I’ve also made your Almond Joy cookies SEVERAL times…so addicting! 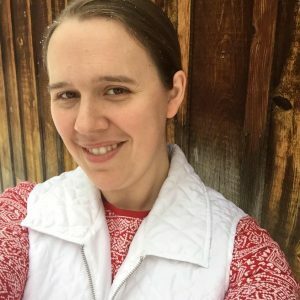 I’m new to THM and actually haven’t started yet, due to waiting on my cookbooks to arrive. From what I’ve read there are S, E and FP foods, so I’m trying to understand what you mean when you say S Fuel? An S fuel is low in carbs, but contains good fats.